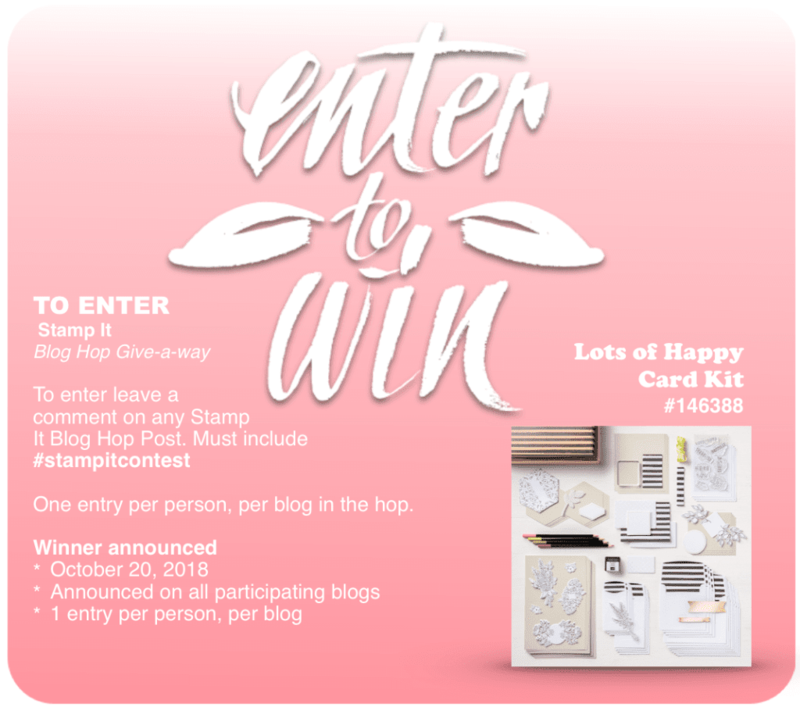 So glad to be joining you again on the Team Stamp It Blog Hop today. You would have come from Rach the Stamper. I hope you are getting lots of inspiration along the way. My card today is about my favorite part of Fall - the changing leaves! I cut out several different leaves from the thinlits from the Falling Leaves bundle - do you know you save 10% if you buy them together? 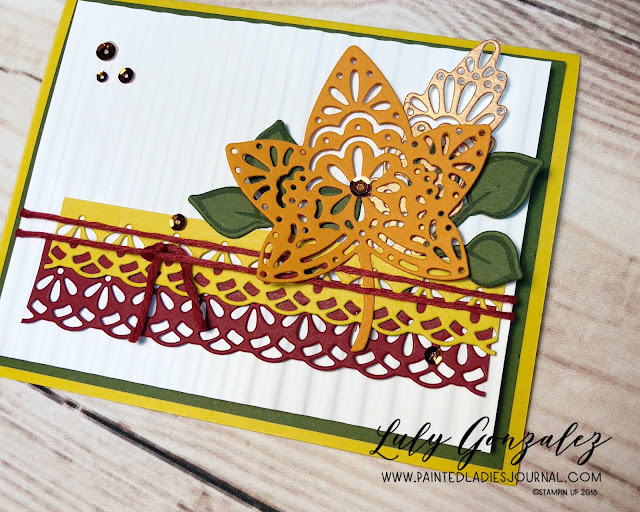 I used Crushed Curry for the card base and edge piece, a layer of Mossy Meadow and two leaves stamped and then cut, as well as a Cherry Cobbler edge trim. Pumpkin Pie leaves and a leaf cut out of Thick Whisper White painted with Bright Copper Shimmer paint. I have a piece of Whisper White that was run through the Dynamic Impressions Corrugated Embossing Folder popped up on the Mossy Meadow. I did wrap a piece of Cherry Cobbler twine from the Festive Farmhouse Twine trio before I attached. 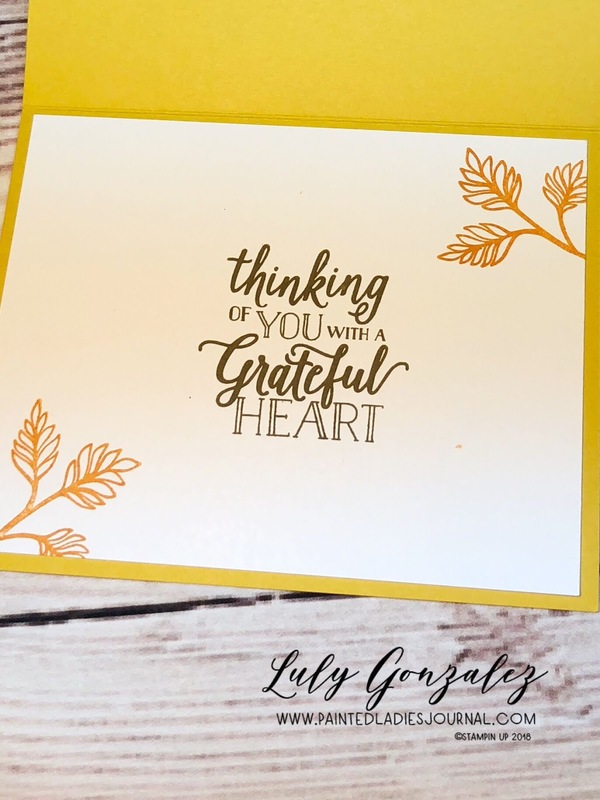 The final steps were to add a few of the Mettalic Sequins and stamp my sentiments and leaves in Soft Suede and Pumpkin Pie on the inside of my card. Así que me alegro de estar uniéndose a ustedes de nuevo en el equipo de Stamp It con el blog hop hoy. Habrías venido de Rach el Stamper. Espero que estés recibiendo mucha inspiración a lo largo del camino. Mi tarjeta de hoy es sobre mi parte favorita del otoño-las hojas cambiantes! Corté varias hojas diferentes del thinlits del paquete Falling Leaves-¿sabes que ahorras un 10% si las compras juntas? Utilicé el Crushed Curry para la base de la tarjeta y la pieza del borde, una capa de Mossy Meadow y dos hojas estampadas y después cortadas, así como un adorno alegre del borde del Cherry Cobbler. Hojas de Pumpkin Pie y una hoja cortada de Thick Whisper White pintado con Shimmer Copper brillante pintura. 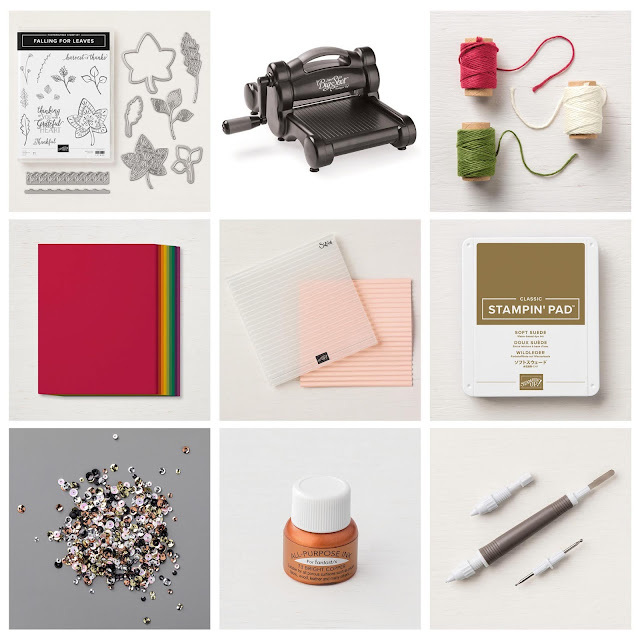 Tengo un trozo de Whisper White que se ejecuta a través de las impresiones dinámicas Corrugated Cardboard embossing folder en la Mossy Meadown. Envuelvo un trozo de Cherry Cobbler twine de la casa festiva twine Trio antes de que se adjunta. Los pasos finales fueron añadir algunas de las lentejuelas Mettalicas y estampar mis sentimientos y Soft Suede y Pumpkin Pie en el interior de mi tarjeta. Congratulations to last month's winner Cathy Veverka! Comment here on my blog and tag it #stampitcontest and all the stops along the way for a chance to win more fun prizes. Sign up for my newletter to inspiration delivered right to your inbox too! Comentar aquí en mi blog y todas las paradas a lo largo del camino con #stampitcontest para una oportunidad de ganar más premios divertidos. Regístrate para mi boletín para inspiración entregado directamente a su buzón de entrada también! Beautiful Luly!! Thank you for sharing! 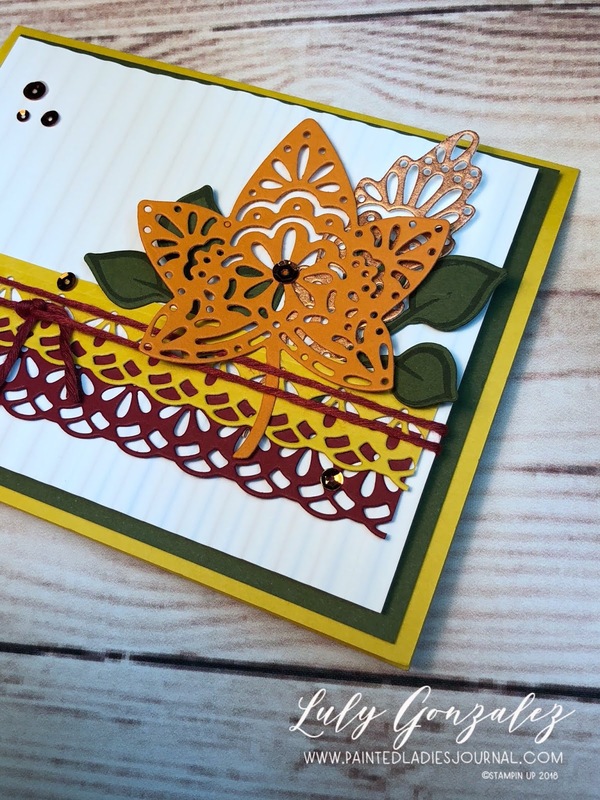 Beautiful fall card - TFS! #stampitcontest - anyone would he thrilled to get a nice Autumn/Fall card like this - it's great !! #stampitcontest Beautiful fall card. Love the inside!